I have that cute card I promised you!! 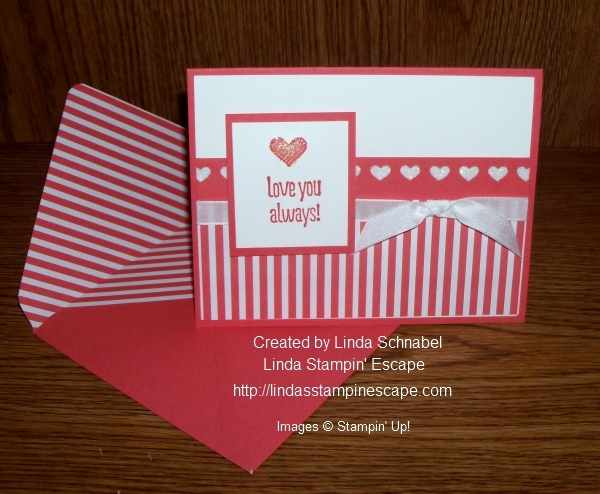 I ❤ my Stampin’ Up! job and I ❤ this bundle. I just had to share a least one more card with you from the Meant to Be bundle. Did you know that the Be Mine Stitched Framelits Dies actually coordinate with the All My Love Designer Series paper … and the pretty flower hearts (2 sizes) can be cut with the dies. Oh my, my … isn’t this cute!! 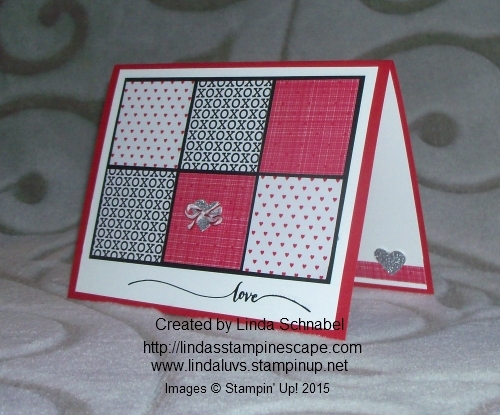 I love the floral heart with the Highland Heather Gingham Gala 6″ X 6″ Designer Series Paper. I ❤ you! The “I” was die cut from the Large Letters Framelits Dies and “YOU” comes from the Celebrate You Thinlit Dies which were from our Sale-a-Bration catalog last year! This year you can get the pretty Organdy Ribbon for Free… 5 bolts of ribbon: Highland Heather, Balmy Blue, Daffodil Delight, Grapefruit Grove and Lemon Lime and its on todays card. 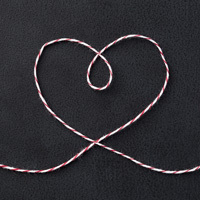 Isn’t it amazing what a little ribbon can do to a card? I hope you enjoyed todays card, and I thank you for stopping back today. Happy New Year! Happy Hearts! 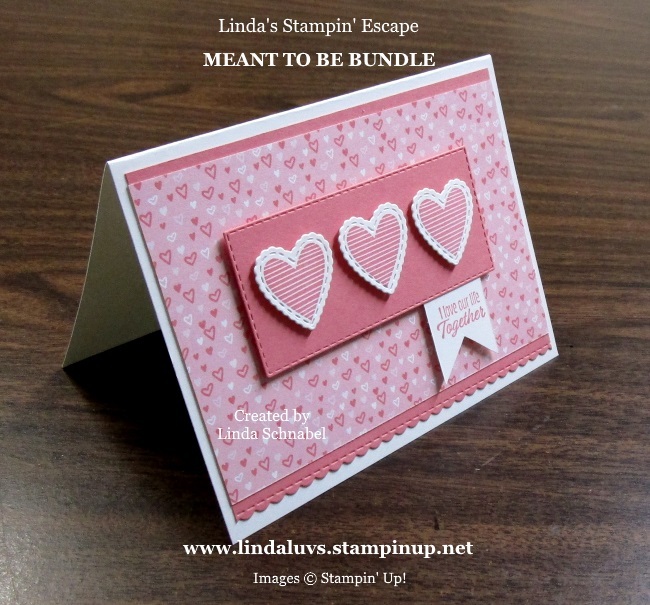 Are you ready to take our “Meant to Be” stamp set to the next level? Let’s start with the coordinating “Be Mine” Framelits and kick of the New Year in style!! Our color pallet today includes the Whisper White and the Flirty Flamingo which truly highlights this small heart pattern from the “All My Love” Designer Series paper. The base is in Whisper White and the Flirty Flamingo somewhat mats the designer paper … the edge was cut with one of the dies included in the bundle. Once the hearts were stamped using the Flirty Flamingo, they were die cut with one of the heart dies in the bundle. 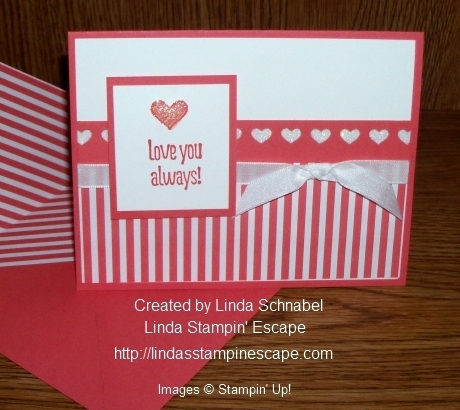 Isn’t it pretty … I love the stitched area around the stamping and then the frilly ruffled edge. The cute little hearts (that look like candy) are popped up onto a piece of Flirty Flamingo that was cut with the brand new Rectangle Stitched Framelits! Wooo hooo …. been waiting for the rectangle and lovin’ the stitched edge. 🙂 The rectangle piece has also been popped up with our dimensionals to create depth and dimension on our card. 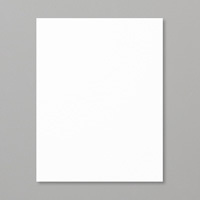 The card was completed with a small banner and a delicate little greeting announcing our love. This card too is on the “simple” side in regards to assembly but fits with those of us who seem to “have” or “want” it all! 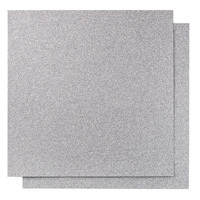 TODAY’S STAMPING SUPPLY LIST …. I’m back today with a simple Valentine card … or just an I love you card. I kept with the traditional red and white for my color pallet, which is what our “Sending Love” Designer Series paper pack contains. I picked the pattern with the little dots that connect the hearts. With that thought I wanted to use the Stitched Shapes Framelits (they are now available again for purchase) I used the oval shapes to create a focal point… my greeting. My greeting comes from the stamp set “Sealed with Love”. 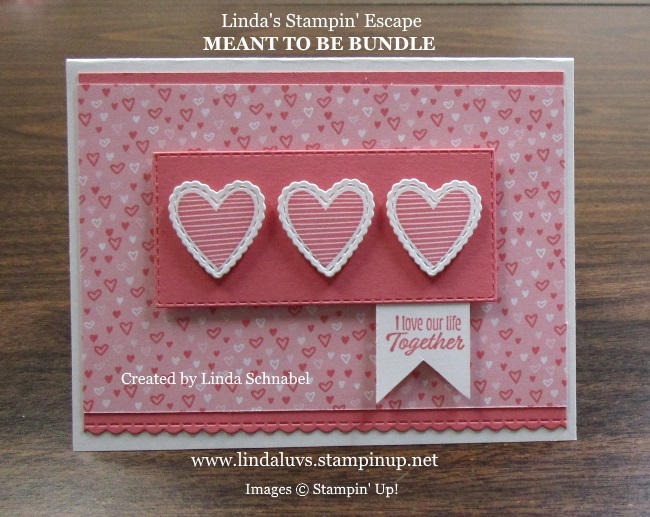 If you love this stamp set, consider the bundle and save 10% and enjoy the cute die cuts that are included. I needed something a little different that had the Valentine look so I chose the “Sending Love Embellishments” … the wood embellishments add such a cute touch and a totally different color – natural. I used a Sharpie™ to color my Rhinestones and then placed them in the center of the flowers. Cute -n- simple that’s all it takes to let someone know you love them. The little heart that is stamped on the inside has the same pattern as our wooden heart. Thanks for taking time on your Sunday to stop by. Just want to say on more thing … GO PACKERS!!! 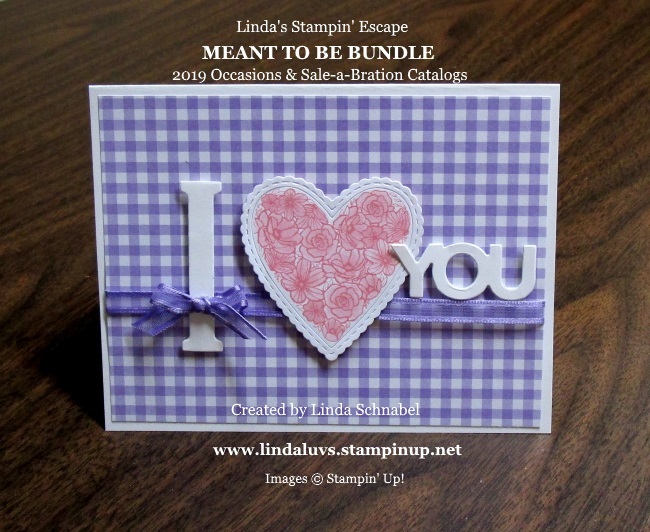 With Valentine’s Day just around the corner what better bundle from the Occasions catalog than the “Bloomin’ Love” bundle. Today’s card focuses more on the stamp set, but you’ll soon see another fab card done with the Thinlit Dies…. what an awesome combination! 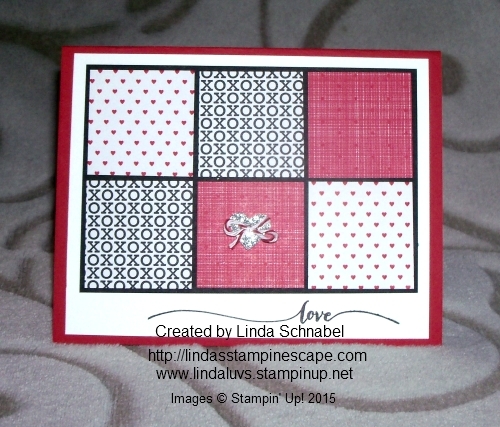 I wanted the basic “red & black” on this card – with a pop of white as my focal point. 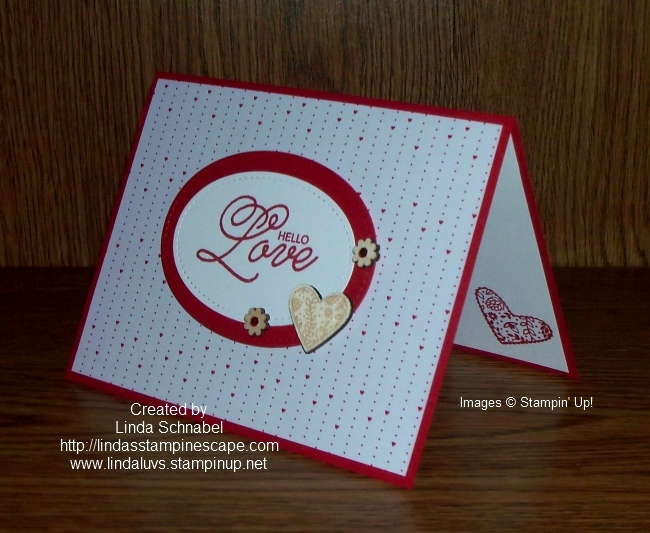 Of course the beautiful heart is stamped in the Real Red and centered on my card. 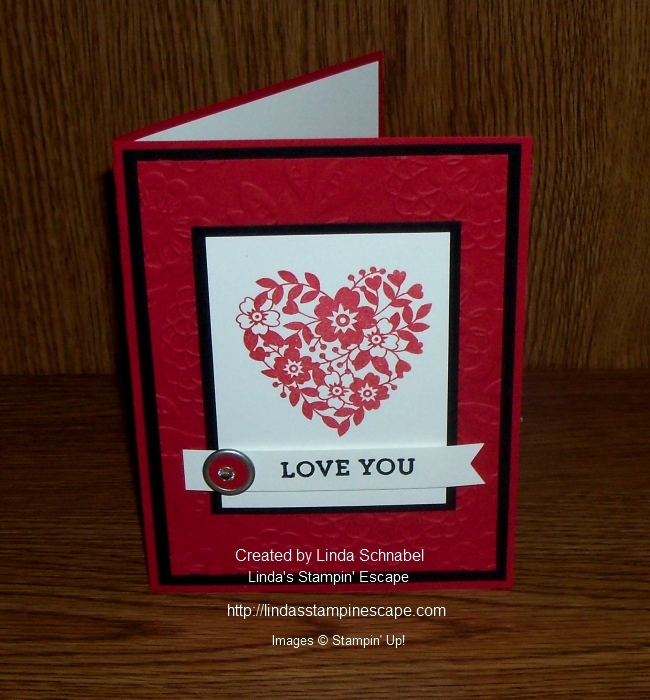 That layered piece was popped up with the Stampin’ Dimensionals. 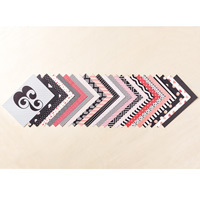 The “LOVE YOU” stamp is included in this 16 piece stamp set… and I used it on my banner. My banner was anchored with the “Basic Metal Buttons” in silver, a piece of red cardstock punched from the Owl Builder Punch (his eye) and topped off with a Rhinestone! 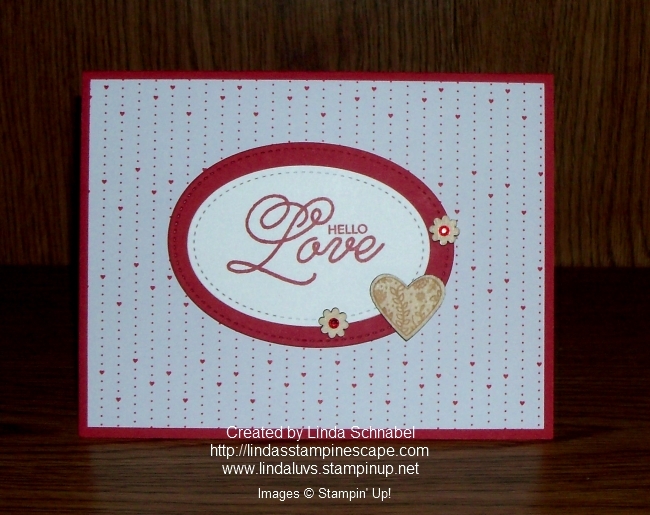 I borrowed a stamp from another great stamp set that works great for Valentine’s day, Mothers Day and so much more. If you look closely … you will see that I have textured the background. I chose the “Lovely Lace” because I thought that it went well with the flowers in the heart. 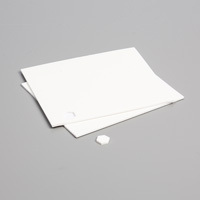 You could also use the “Happy Heart” embossing folder … either of them look wonderful. I hope today’s card inspires you to pull out your supplies and stamp a few Valentines cards … if you need supplies, I have a list of those used on today’s card. Today I would love to share with you the cute card that I made using some of the Weekly Deals. If you would like to see them again CLICK HERE. I started with the Envelope paper because it would help determine my color pallet … I chose the “Watermelon Wonder” for my card. At this point I pulled out the “Envelope Punch Board” because I not only used the paper for my card but created a matching envelope. How fun is that! Next I punched a strip of hearts with the “Hearts Border” punch and decided to put a strip of “Dazzling Diamonds” Glimmer paper behind it … gotta love that sparkle! With so many greeting types in the “Something to Say” you think it would have been hard to chose from, but I was focusing on Valentine’s so the “love you always” was easy. 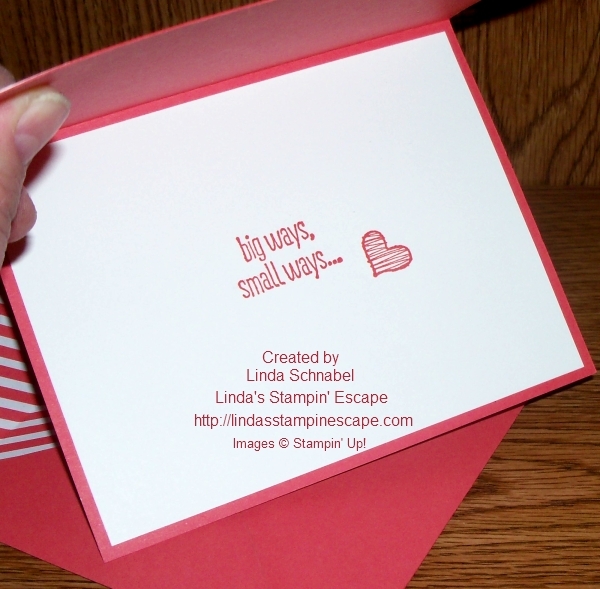 It has a coordinating stamp “big ways, small ways” that I stamped on the inside of my card. The little heart also comes in the “Something to Say” stamp set and I stamped that on the front greeting and on the inside of my card. On the front I added “Crystal Effects” to my heart and then sprinkled it with some “Dazzling Diamonds” while it was still wet … LOVE that effect!! I finished off my card with a simple bow made from the 1/4″ White Cotton Ribbon. It’s so easy to use and I keep plenty on hand because it goes with everything! Thank you for joining me today … I love the company! We’re fighting some mighty cold weather here in Wisconsin … so stay warm! If you’re in one of those nice warm states … send some our way. Thanks again. TODAY’S STAMPIN’ SUPPLY LIST … Please let me know if you need help or have questions on any of the items listed below. You may click on anyone for more details or to begin shopping. This weekend I shared with you our January Paper Pumpkin and an alternative project you can make with the kit. So what happens when you use up all the contents of your kit? Well … one of the best things about the kit is the stamps!! You can use them over & over & over! Today’s card is using the stamps and fun stuff you have in your stamp room. Let’s begin with the “Red Glimmer paper”, left over from Christmas and our “Stacked with Love” designer paper that we used earlier this month. I picked the XOXOXO paper because of the greeting I was using from the kit, and the Basic Black cardstock was the obvious choice for the base. 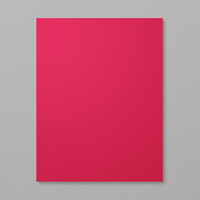 It ties in beautifully with the designer paper and really makes our red glimmer paper pop. I wanted to use the “Postage Stamp” punch because I thought it would be “fun” when “sending” hugs & kisses. I trimmed the center out of the glimmer paper that is behind the designer paper and used it to back my postage stamp. I punched the center of the postage stamp so you could see more of the glimmer paper and it’s cute! 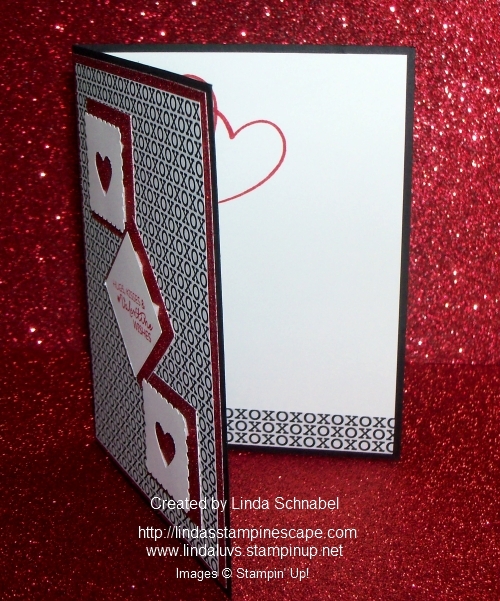 I took my left over designer paper and added it to the inside along with the hearts … stamped in red, from the kit. This picture also gives you a great shot of how I “popped up” the postage stamp punch and greeting. Lovin’ that Valentine Designer Paper! Today I’m going to share another Valentine Card with you. I figured since I had all my supplies on the table yet, I could show you another way to use them! If you are like me …. 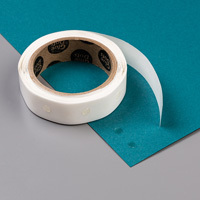 you have a hard time throwing those left over pieces of cardstock and designer paper away! Well thank goodness you didn’t, because look at what you can do with leftovers! 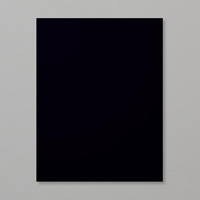 I cut yesterday’s scrap pieces down into 1-1/2″ squares and arranged them on a piece of black cardstock. WOW … how simple can you get! I added a heart, punched out of the Silver Glimmer paper and topped it off with a cute little bow made out of the Cherry Cobbler Bakers Twine. Our greeting comes from the “Hello Life” stamp set that I used yesterday. I really like this stamp set. When you look at it in the catalog, just be aware the the pictures on the right side are only shown at 50%, the real size is what you see on my card and I think is a perfect size!! As you can see from this peek inside the card that I used a few more left over pieces to embellish the inside. Nothing wrong with showin’ some more love. 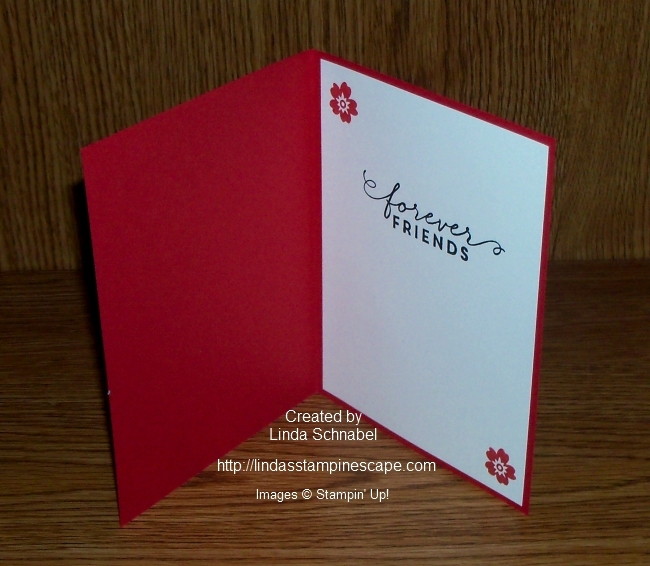 Thank you for checking out my blog today … I hope you enjoyed the card. Have a great day … it’s almost Friday!